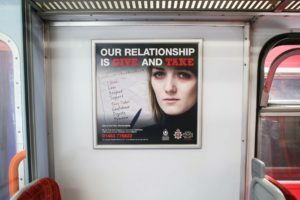 Design Inc has recently completed another sensitive public information advertising campaign for Surrey Police, to raise awareness of ‘coercive control’. Described by Nigella Lawson as ‘intimate terrorism’ Coercive Control is a corrosive form of domestic abuse that erodes a victim’s liberty. The term itself was developed by Professor Evan Stark, a forensic social worker, lecturer and author whose original worked influenced the Home Office to re-define domestic abuse to include the removal of basic human rights. Importantly, this form of domestic abuse is now a crime in its own right, meaning that charges can be brought without physical violence being present. The phrase ‘coercive control’ is slowly getting out there into the public domain. Storylines on popular TV and radio soaps (The Archers recently featured a long-running coercive control plot) are becoming more prevalent; the BBC documentary ‘Behind Closed Doors’ aired in March, receiving positive public feedback. The Surrey Police Campaign will use the #behindcloseddoors, and will feature adverts at bus shelters, Sainsbury’s, shopping centres and on the South West Trains network, as well as face-to-face and online activity. 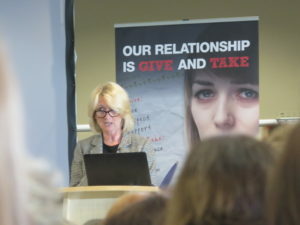 The campaign launched at a one day conference at Sandown Park towards the end of May providing domestic abuse advice to the public and also for the workplace environment. Most domestic abuse campaigns tend show the violence associated with the behaviour but, for this campaign, it was all about focusing on the education of the new crime. Coercive control is not necessarily about the violent side of domestic abuse, although of course it is well documented that the behaviours could lead to that. 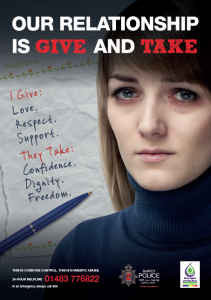 Instead, this campaign was needed to highlight the controlling behaviours within a relationship, where victims are treated no better than hostages by their partner. 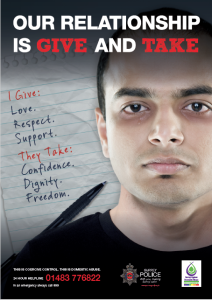 The campaign was created by Surrey-based agency, Design Incorporated. They were familiar to Surrey Police as they had previously delivered successful public information campaigns highlighting other diverse and sensitive subjects: Burglary, Child Sexual Exploitation, Mental Health to name just three. Reported incidents of Domestic abuse reveal that this issue is not restricted to gender, race or religion. The campaign needed to extend the reach of its message to cover all relationship types. And as such, different adverts were created to suit. Male on female abuse is the most highly reported but it is known that, for many reasons, domestic abuse is under reported. The advertising campaign coincides with the Behind Closed Doors conference on May 24th, 2016, the collateral for which Design Inc were also commissioned to create. This included presentations, banners & leaflets, case studies, graphics, etc. For more information on public information advertising campaigns including the domestic abuse campaign featured here, please speak with Frank Norman, Client Services Director on 01784 410380 or simply email. To view our portfolio including more of our public information advertising campaigns for Surrey Police please click here.